Have you ever observed someone as they are about to do something that could cause them a lot of pain or even endanger their life? If you have you’ll be familiar with the skin crawling and cringing feeling that accompanies these moments. As a climber I often observed people doing things at a cliff face that mean they are dancing with death. Often this is an indication of their “unconscious incompetence”, in other words they have no idea of the potential harm they are placing themselves in. A good leader appreciates that when working with people, often “conscious competence” is more desirable than “unconscious competence”. By its very definition “unconscious competence” means that a person operates at a level that they are so well drilled in the task they are performing that they don’t think. This may be a good thing completing a task but when it comes to leadership, it can be just as much a hindrance as a benefit. 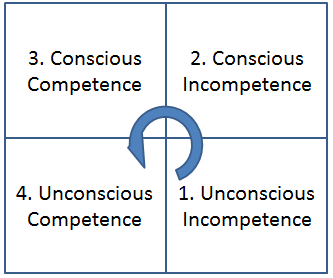 The term “unconscious competence” is used in the “Four stages of competence”” learning model. Summarised briefly a person moves from a state of no idea they are incompetent, to becoming aware of their incompetence. They then develop their competence at a level where they have to think about a task to be competent at it and finally they reach “unconscious competence” which means that the skill becomes second nature. Think of the stages you went through leaning to ride a bike or tie a knot in a rope. So how do these stages apply to practical leadership? How effective are leaders that are operating in an “unconscious competence” manner? In my own experience it has meant the difference between growing and achieving better results versus getting stuck in a rut and failing myself and those I was leading. Below is an essential element to this theory that is often forgotten and 3 tips on how to develop this quickly. Applying growth mindset theory to our lives can be a challenge but in my opinion, there is no area that it is required more than in young people as they navigate their early experiences of learning and development of their work ethic and self esteem. Many people with unknown potential limit their learning and opportunities due to their mindset being closed. Closed mindsets believe we are only as good as our results. We are capable, only of things “within” our predetermined or established level of competence. In other words, if I’ve been told I’m capable, if I’ve been told I’m leadership material and these opinions are the overriding “why” that means I’ll try things, then I am placing a higher level of importance on the opinion of others about my capabilities rather than my own self belief, awareness and joy of self discovery. This is why developing a growth mindset is so important. Here are three points that are essential for you to introduce more of a growth mindset into your life and those around you. In a world where availability of ideas and information isn’t a problem, the skill it seems is keeping the right things in the forefront of your mind rather than suffering or succumbing to, information overload. Over the course of a day recently, I had 3 meetings. I was reminded of 4 simple yet powerful bits of wisdom.